There so many great locations at Wild Dunes Resort, located in Isle of Palms, Sc, for any wedding photographer to capture wedding images with it's charming and picturesque venue. On this day, I had already met the groom and the bride by photographing their engagement session months prior to their wedding day. I knew the groom was a gentleman and wanted to have a great time at his wedding. 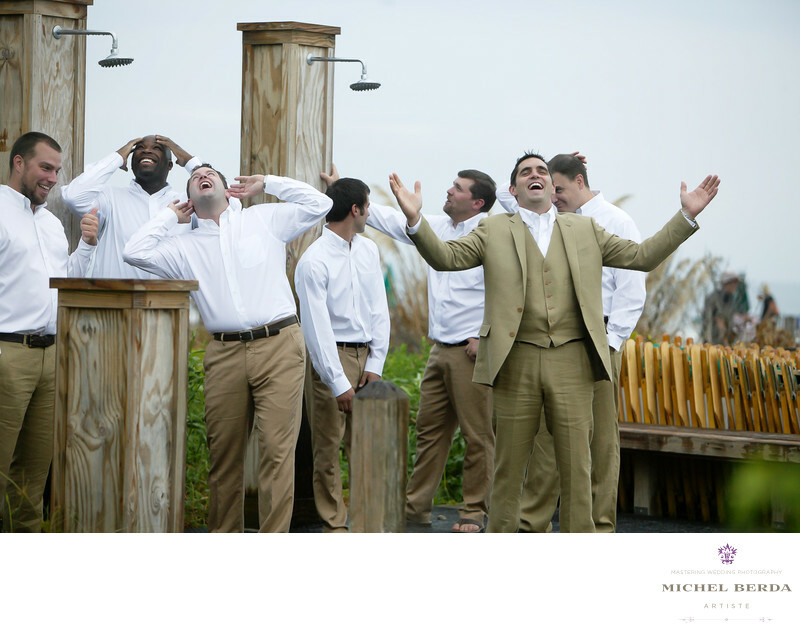 Upon arriving at Wild Dunes Resort, on the Isle Of Palms, Sc, I started photographing the groom and the groomsmen, every one of them total characters. I always allow myself with my designed timeline, a minimum of one hour for this session, where I can walk around such a beautiful property and capture all of its wonderful backgrounds. That leads me to this amazing photo, one of my favorite, as the groom and groomsmen were about to walk to the beach, I noticed the perfect photo opportunity, when I stopped everyone and said "This is a perfect place for a photo" everyone looked at me and wondered what I was talking about. After a few minutes of coaching with some great poses from the groomsmen and groom who kick it up a notch, we ended up with this amazing image, I am glad they really did not take a shower that would have been a total disaster, ha,ha. Every wedding I photograph is different and has an appropriate fit, and image for that specific wedding for those clients, and this is truly the way I capture them. Especially as a wedding photographer at Wild Dunes Resort, Isle Of Palms, Sc. Keywords: Destination Wedding Photographer (117), isle of palms (30), Isle Of Palms Sc (18), Isle Of Palms Wild Dunes Resort (18), sc (309), Wedding photographer In isle Of Palms (18), Wedding Photographers (198), Wedding Photography (123), Weddings (168), Wild Dunes Resort (21).